We are a very happy family, who live have lived in London for 30 years. My family constitutes myself (44 yrs old), my husband (44) and my daughter Ana (34)We are true animal lovers and have numerous pets including cats, a dog and a cocktail. We all love to travel and meet new people from different cultures and walks of life. I describe myself as a very well mannered friendly individual, who enjoys making friends and learning about new and different cultures. I am very honest and loyal and strive to provide the best customer service to my guests. I grew up in this same village and have always been in love with the area thus why I decided to purchase the villa there. It is a beautiful area providing great peacefulness but is nonetheless in range of many good amenities such as shops, cinemas, restaurants and bars. Additionally, it is only 30 minutes away from the capital Lisbon, where you can enjoy the beautiful scenery of this monumental city and again enjoy further amenities. It is also 30 minutes away from a range of many beautiful beaches either towards the south of Lisbon in Costa da Caparica or towards the West in Peniche. There are the opportunity to play golf in the town of Obidos and to do some horse riding a short 5 minutes walk away from the villa. The villa is large and the outside garden areas are extremely spacious and fenced providing privacy to guests. There is a private pool so that guests who simply want to relax and enjoy the peacefulness of the villa may do so without having to leave the premises. Because the pool is not very deep it is also great for the children who enjoy spending their time in the water. Pets are welcome, and the villa is very pet friendly. The villa has everything you may need including all kitchen appliances and household appliances. We also provide towels and bed clothes for the beds. There is possible access to the internet if requested. If you enjoy good food at reasonable prices we can recommend very good restaurants in the area which make delicious food. Bathroom with bath/shower, wc, bidet and lavatory. Separate wc with a lavatory and bidet. Large lounge with sitting area and fully equipped, TV, DVD, HiFi. Dining room connected with lounge, contains a large dining table. Newly furbished kitchen with all needed appliances. Gas cooker with oven, fridge/freezer, washing machine, microwave, kettle, toaster etc. only 40 minutes away there's Serra da Estrela wich is about 2000 mts high, where you can enjoy some amazing skiing. 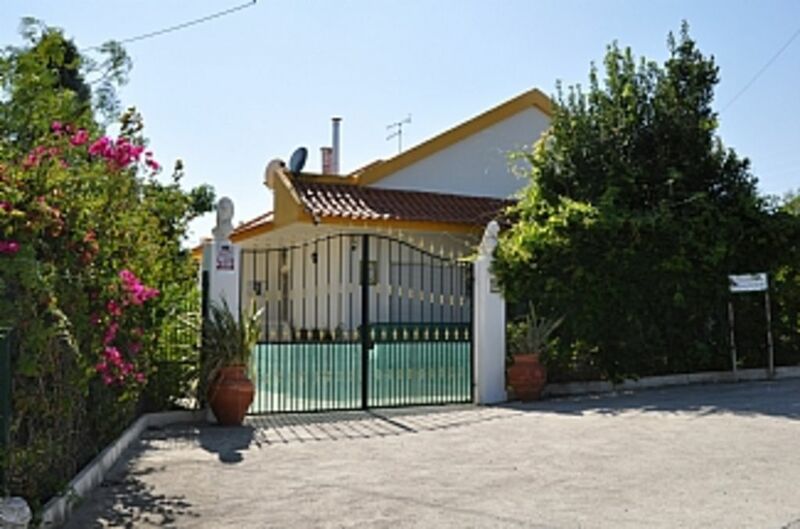 18 hole golf course located just 30 minutes from the house in Rio Maior and Obidos. Notes on accommodation: Being a typical Portuguese house, the inside of the house remains very cool in the summer which is excellent giving the high temperatures of the spring summer season. A salamander stove maintains the house warm during the winter periods. Extremely suitable for children and pets, as house is all on ground level and property is closed off with fence and gate. There is plenty of open space to take walks and take in a bit of nature. The house is installed with an alarm system for total security of the property and guests belongings. You will also find a safe available at your disposal if you wish to be extra careful with your belongings. The house is extremely comfortable and cosy enabling guests to feel at home whilst on holiday.The person who will give you the keys when you arrive is Carlos, he is the caretaker who looks after the property when it is being rented to holidaymakers. He will be at the villa to greet you and and hand you the keys when you arrive. Outside: The outside area of the house is arranged with beautiful gardens of flowers and fruit trees surrounding the front and side of the house. There are vineyards extending the length of the property, past the gardens where we pick our own grapes to produce our own wine. Guests are able to pick their own fruit from the fruit trees at any time, and wine is also available for a reduced fee.The patio is fully tiled and stretches the whole length of the house, contains table and chairs for outside meals in wonderful sunny summer days. Plenty of space for children and pets to run around. There is plenty of parking space for 6 cars. We love the peace and tranquility of the place and like the fact that it is situated in a small village where life has continued the same for centuries. Where the friendly village people greet each other when passing and you can walk around the corner for a coffee or a glass of red wine. We hope our guests will enjoy the place and the atmosphere as much as we do. Cleaning / Towels / Linen / Maid service: Towels and linen are included and we do offer a person who may clean the house every couple of days. No maid service. Other: Storage room in the kitchen where you may store anything. Ironing board and iron kept here. The villa sits on a very large plot with plenty of outdoor seating. It is very good value for money with a fantastic pool, bbq and pizza oven. Lisbon is just a 40 minute train ride with a good free car park at the station in Azambuja. Any queries or questions were answered promptly by Ana who is the perfect host. we had a very comforable stay at the villa.But i must express my feelings,we only got half of the villa,having payed for all of it (slightly irritating),and the other annoying fact was that in the bathroom was full of hair,very off putting. Summer sizzler in a great location.5***** for value and service !!! Adult family of 3.Stayed in this wonderful villa for 10 days at the start of July. Ana's description and photo's do not do it justice.Property is surrounded by fruit trees and flowering shrubs, there is plenty of space inside and out, it can easily accommodate 6-8 people.The pool and barbecue area are the icing on the cake.Plenty of outside seating around the grounds, benches,chairs and even a hammock.No immediate neighbours, so privacy is assured.Don't go expecting everything to be plush and brand new but all that is required for a comfortable stay is present.The local village does not have any shops but there are two little cafe/bars, where we found the local residents to be incredibly warm and welcoming, the area is definitely off the usual tourist trail but is only approx. 30-40 mins. via train to Lisbon.We made a decision not to hire a car and used a recommended local taxi driver,Fernando,to get to/from Azambuja[local town approx. 5km away] when we went food shopping or for a meal out. He was reliable and inexpensive, so it worked out fine.There are a number of places of interest nearby and good Portuguese restuarants in the surrounding towns.Highlight, activity wise was the couple of hours spent horseriding in the hills. A great place to relax and unwind.We had planned to do more things, activity wise, but we were just too relaxed to bother. Ana offered a great service, she communicated with us leading up to our holiday and answered all our queries, arranged an airport pickup, had hire bikes at our disposal and just came across as a warm and genuine person.As a family, we would have no hesitation in recommending her and her property. 5*****/5*****. Thank you so much, I hope to see you again soon. This quirky Villa is surrounded by farmland in a rural part of Central Portugal. The garden and pool are lovely with lemon, orange and Avocados gowing on the trees. Also there is a lovely outside cooking,dining and seating area close to the pool so al-fresco living should be easy in the summer. We stayed at the villa in January so needed the electric radiator and fire especially after dark. Ana the owner was delightful from begining to end; providing good information on how to access the villa and quickly dealing with any queries we had whilst we were there. The position of the villa was ideal for visitors with a car but most things were a short drive away rather than within easy walking distance. Best of all a train link to Lisbon is available in the nearby town which makes a visit to the Portuguese Capital very stress free. Rooms in the villa are light and airy with an abundance of tiles as is traditional in the area. All the basic ammenities are there but some (such as the fridge with its very small (for 8) freezer compartment and the chipped crockery) are becoming a little dated. This would seem to be an excellent Villa for dog lovers as without really trying I counted a dozen dogs roaming the surrounding farms. Conversely if you do not like dogs or indeed the noise they make this might not be your number one choice for a summer holiday. Thank you very much for your staying! THANK YOU WILL VISIT AGAIN . All the information provided is accurated and it was very impresive when we arrived. The swimming pool is fantastic as well as the rest of the house. Very clean and with a very large list of kitchen gadgets. The nearest village has several cheap restaurants (basics), and a quite good seafood restaurant. There is also a Supermarket for everything needed. There are many castles and museums to visit in Lisbon such as: Castelo Sao Jorge; Padrao dos Descobrimentos; Mosteiro dos Jeronimos and the fantastic Lisbon Zoo. You can find great restaurants and bars at the famous Bairro Alto and Parque das Nacoes in Lisbon. If you enjoy a bit of shopping there is a diverse range of shopping centres such as Colombo, El Corte Ingles, Vasco da Gama and close to the house Campera Outlet shopping.Also you cn enjoy the beautiful island of Berlengas which is located in Peniche. Among other activities, there's boat rides , water theme parks, horse riding, for the more adventurers, there's sky diving as well.The swimming pool is open from the 1 st of June onwards,close end of October..
Coast/beaches is within 30 minutes driving distance, very accessible. Peniche, Nazare and Sao Martinho are located to the East Coast. There are also lovely beaches located to the South of Lisbon such as Costa da Caparica, Setubal, Cascais and Estoril. Lisbon (Portela) airport is within 30 minutes driving distance (car rental recommended). Azambuja Train/Rail station straight to Lisbon (20 min), free car parking outside station for as long as needed. 30 minutes driving/train distance from central Lisbon, where many places of interest can be found. Nearest village is within 5/10 minutes drive and many shops can be found there. Smaller shops can be found within 5 minutes walk from the house. We provide tea,coffe, milk,biscuits on your arrival.There is a cash point 5 minutes walking distance from the house, and small supermarkets. Banks and large supermarkets can be found in the nearest town of Azambuja 5 minutes driving distance. There are many castles and museums to visit in Lisbon such as: Castelo Sao Jorge; Padrao dos Descobrimentos; Mosteiro dos Jeronimos and the fantastic Lisbon Zoo. You can find great restaurants and bars at the famous Bairro Alto and Parque das Nacoes in Lisbon. If you enjoy a bit of shopping there is a diverse range of shopping centres such as Colombo, El Corte Ingles, Vasco da Gama and close to the house Campera Outlet shopping. Booking Notes: Arriving after-3pm departure-before 10am as the villa needs to be clean to be ready at 3pm, remaining balance is paid when you get your keys at the villa. Please be aware that we also charge a £100 damage waiver fee in addition to the final fee - this charge will be returned to you within one week of your departure, after confirmation from our manager that no loss or damage occurred during your stay. We charge £75 for the service cleaning. Thank you. Changeover Day: This is flexible and can be arranged. Notes on prices: Prices are for the property per week in UK pounds or euros. Discounts are given for longer periods of rental, such as a whole month. Off peak from 300.00 t0 350.00, pick time from 400.00 to 475.00.